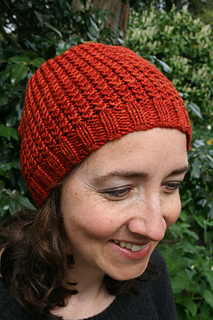 The perfect hat for special DK or worsted yarns. This design is ideal for semi-solid colours. Worked in two shades, the strands of yarn look like they have been inked over the top of the other. 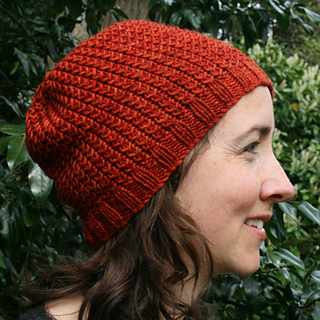 Worked in just one colour, you can make the perfect cosy hat from one snuggly skein. Worked in the round, it’s a quick, unisex gift. Knitted in the round, they are easy-intermediate projects. 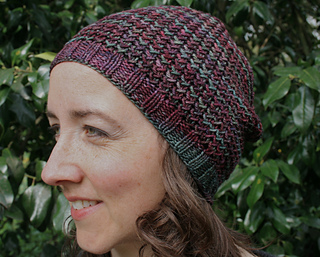 Want to share your project or find tips from other knitters? Visit the Pattern thread in our group. Can adjust slouch with gauge & yarn choice. 180m/200yds DK/worsted yarn. All in one colour, or 90m/100yds each of a darker colour (M) and bright contrast (C). Needles for your preferred method of working in the round e.g. magic loop or double-pointed needles, in sizes: 3.75mm, 4mm & 8mm/US 5, 6 & 11. Rust: Sweet Georgia Trinity Worsted (70% superwash merino, 20% cashmere, 10% silk; 182m/200yds per 115g skein) 1 x Cayenne. Plum: Fyberspates Vivacious DK (100% superwash merino; 23m/251 yards per 115g skein) 1 x Tweed Imps. Thank you to Akshata for tech editing.